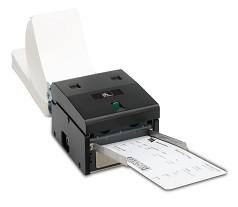 TTP- 2100 Series - Business made easy! Make doing business more enjoyable for your customers with kiosk printers that print high volumes of ATB1 boarding passes, bag tags, tickets and more. Reduce the wait time with self-service convenience. Low-maintenance kiosk printers ensure less downtime. Multi sensor array to automatically detect a multitude of media like bag tags, credit card size tickets etc.